We are a moving company that believes in value. Value in moving is what separates the great m overs from the fly by night moving companies. Too often, people looking to move are shopping solely on rates. This can be dangerous but we understand why our customers want to reduce their moving costs! Moving usually dances around other very expensive times in one’s life and is just another expense along a very arduous and costly journey. While we can’t offer you the best moving rates in Toronto, we can offer you advice and methods for reducing the cost of your move. One thing we see often is wasted time finding parking. Failure to plan for parking of the companies moving truck coming to your home on moving day can crank up the cost of your move. For one thing, not having good “access” can make for wasted time jockeying for position at origin and/or destination. Not having a good spot may also mean a longer walk. What you are moving is the core of your moving estimate but the length of a walk can significantly increase the required to complete your move. 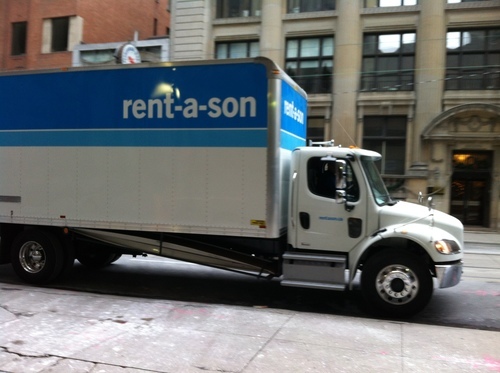 Most of the time you can help reduce the cost of your move by solidifying and planning for a spot for the truck. This can be done using your own car(s), pylons or just talking to building management if you are moving in a condo in Toronto. Our movers work incredibly hard day in and day out and having a great spot for parking can often set the tone for a really successful day of moving! Do yourself and your movers a favor by planning for their arrival at both your origin and destination (unless of course it is a long distance move). We promise it will save you time and get your move off to the right start!